The concept of Smart Cities is often linked with the use of advanced “big data” technology to inform safer, more efficient services and living environments. Yet this is only part of the story. In addition to providing faster, more affordable and lower-risk access to basic needs, Smart Cities also seek to enrich their citizens’ experiences of their environment. It’s an objective long held, of course, by architects, landscape architects and urban designers. By applying their creativity and “design thinking” capabilities to address the social and spatial conflicts inherent by cities, these urban professionals aim to shape urban spaces that are functional, have aesthetic appeal and foster wellbeing. Consequently, the University of Adelaide is investigating ways to productively marry their unique expertise and perspective with the use of cutting edge Smart City technologies for citizens’ benefit. A recent collaboration between the University’s School of Architecture and Built Environment and the School of Computer Science represents an exciting step forward. A group of students from each school worked together to create an interactive, augmented reality installation for the opening of the 2017 Telstra Australian Smart Communities Conference, held in Adelaide from May 29 to 31. 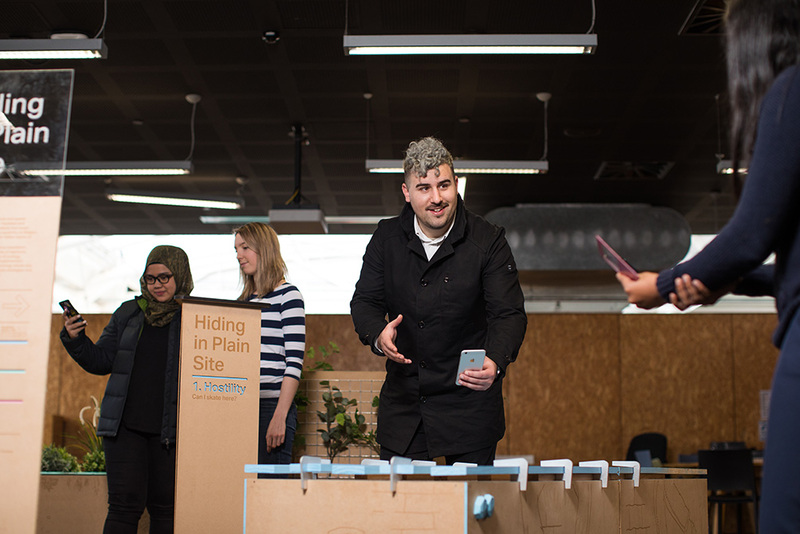 Called Hiding in Plain Site, the walk-through installation incorporated a custom-developed app that responded to signals from embedded beacons by overlaying relevant information on visitors’ phones about the areas they were looking at. According to project leader Associate Professor Julian Worrall of the School of Architecture and Built Environment, the technology deepened visitors’ understanding of the built environment by making visible aspects of the city that often go unnoticed, and inviting reflection on the strategies used by designers in shaping various urban spaces. “We effectively turned visitors’ smart phones into live, location-sensitive ‘tour guides,’” says Associate Professor Worrall. “Our goal was to reveal the hidden layers of the city through augmentation; to allow people to read the underlying design techniques and goals of the physical spaces they were in, while they were in them. The architecture students first researched the major conflictual issues of urban space, and then constructed the installation to represent them, with the computer science students developing the app. Associate Professor Worrall says seeing the students learning from each other’s different perspectives and approaches boded well for future Smart City design. “The most positive outcome was seeing the students develop a constructive working relationship that fostered design thinking. “What was first complicated soon became constructive; architecture students developed an understanding of beaconing technology, computer science students developed an understanding of issues in urban space, and both learned more about how the digital can complement the physical. This entry was posted in Impact stories, Smart cities, Societal Wellbeing, Uncategorized. Bookmark the permalink.